Holidays can throw patients’ schedules off, making it difficult to stay adherent. Med sync ensures patients have the prescriptions they need, when they need them, without last-minute demands on your pharmacy. Aubrey Pharmacy, in Aubrey, Texas, is closed every Sunday and for six holidays each year. But owner Steve Coomes doesn’t worry about a slew of customers coming in with last-minute refills. Having implemented med sync about five years ago — which Aubrey Pharmacy calls “Sync Rx” — Aubrey Pharmacy has more than 270 Sync Rx customers picking up their prescriptions on regular schedules every month. Before the pharmacy closes for Christmas and New Year’s, technician Margie Green manages the med sync program to make sure all patients have their prescriptions. This ensures patients have the drugs they need and remain adherent during the holidays. It also minimizes urgent requests for the pharmacy. In Aubrey Pharmacy’s experience implementing med sync, here are five important lessons. “We’re five days ahead of the customer,” Coomes said, instead of waiting for someone to call or walk in asking for a refill right then. If everything is ready in advance, the pharmacy may contact the customer to say their prescription is ready two to three days early. That gives customers more time to fit picking up medications into their schedules. Also, with the predictable demand of med sync, Aubrey was able cut inventory by $35,000. If a customer will be out of town, insurance usually allows a fill seven days early. But Aubrey Pharmacy doesn’t change the normal med sync date. For a customer who planned to travel to Europe for three weeks, the pharmacy began processing early fills three months in advance. Just make med sync the normal way your pharmacy does business; make it the default. “It beats the heck out of trying to enroll them,” Coomes said. Some pharmacies that have made med sync the default may charge patients who are not enrolled for certain services such as delivery and compliance packaging, which are free for sync patients. Coomes has found that many patients ignore phone calls. If they see a missed call from the pharmacy, they won’t even listen to the message. They will call back and ask why the pharmacy called. 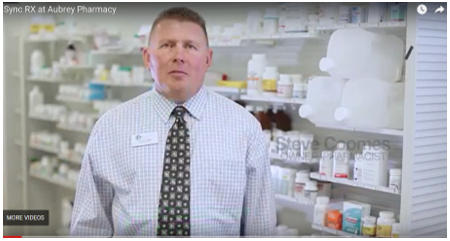 Instead of calling, Aubrey Pharmacy is using multiple texting methods, including its pharmacy software and a secure texting application. Many patients prefer this method of communication and notice it. “A text you can’t help but read,” he said. Local delivery patients are often a good fit for med sync. This can reduce the number of monthly deliveries and save the pharmacy money. Aubrey Pharmacy also ships medications to sync patients when they travel. For example, Aubrey has sent medications to RV parks where patients are stopping on a long trip. A well-managed med sync program is a win-win. It keeps patients adherent to their medications year-round — even during holidays. And, it keeps the pharmacy’s workflow steady, improves operations and saves money.